Dom Rep: What Happened After Amelia Vega? Part 2- What happened after Amelia? Hi, guys! This is part two of my last thread. After Amelia won Miss Universe, pageants began to gain a boom in the Dominican Republic. As a result, events are better recorded with more footage and videos available of the contests that happened after Amelia won! 2004 was a big year for the Dominican Republic. People were still excited with Amelia Vega's triumph in Miss Universe, the year before. Under new management by new director, Magali Febles, a lot of changes were expected to happen. This year the turn out was smaller but the quality of candidates was incredible. Over 33 girls of all varieties from all over the country wanted to fight for the crown of Miss Republica Dominicana Universo. That year the contest was grand with artists like Don Omar and Victor Manuelle, invited to perform. It had been almost 2 years since Amelia had been crowned Miss Dominican Republic so this year sought to make up for the lack of contest in 2003 while of course, paying homage to Amelia Vega. The two favorites of that year were undeniably, Isaura Taveras (Miss San Cristobal) and Pamela Sued (Miss Santiago and winner of Miss Internet prize). Both girls dominated the scenario with their vibrant personalities and beautiful faces. However, during the night of the pageant, pageant fans were surprised to see Miss La Vega, Larissa del Mar (aka Larimar) Fiallo (also the recipient of Miss Congeniality that night). 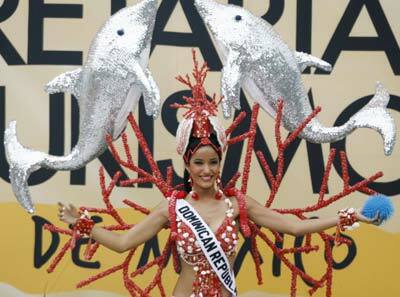 As Miss Dominican Republic, Larimar faced a lot of criticism from pageant followers. Many believed she was a downgrade from Amelia Vega. Designer, Jorge Diep, who dressed all the girls that evening, also confesses that he believed Isaura Taveras, the eventual 1st runner up, would have been the winner. However, he also believed that Isaura's victory was prevented because she had ended a romantic relationship with a radio executive from the Dominican Republic. Yet despite this, she was seen as the true winner and Larimar was teased by online followers and called "Narimar," a play on the word Nariz (Spanish for nose) and her name. She had broken her nose as a volleyball player and had gone to Venezuela to get a fix, and operation we she herself confessed she was disappointed with. Luckily under the training of Magali Febles, Larimar was able to take advantage of the great doctors, surgeons and dentists in Puerto Rico. For weeks she would train side by side next to Alba Reyes (whose election was also criticized). Unfortunately, Larimar failed to impress the judges at Miss Universe. Weeks after her return to Dominican Republic, Larimar was a victim of an attempted kidnapping and suffered bruises from aggressive handling. However the police believed a different story happened with possible indications of abuse. Despite this drama, Larimar was able to pass down her crown with ease and today is proud mother, wife, social media user and occasional television host. Interestingly enough, while she did fail to place in Miss Universe, many of her competitors in Miss Dominican Republic did very well in international competitions. Yadira Geara (Miss Distrito Nacional) was 1st RU in Miss International 2005, Claudia Cruz (Bonao) was 1st runner up in MW, Isaura Taveras would be a finalist in Miss Italia Nel Mondo 2004 and along with Pamela Sued and Carolyne Aquino (Samana, they would all have huge careers as television hosts in the Dominican Republic. Without a doubt, things happen for a reason. Without a doubt, most people knew that Renata Sone, Miss Distrito Nacional was going to win Miss Republica Dominicana 2005. She was, tall, elegant and beautiful. She was born in New York, but was brought back to the Dominican Republic at a young age to be raised by her grandmother. This year the quality of competition had dropped after not placing the year before. Yet Renata's biggest competitors were Diana Henriquez from New York and Amell Santana from Hato Mayor, both who placed as her runner ups. Fortunately, Renata Sone was the best choice to go to Miss Universe. With only a month an a half of preparation, Renata Sone was prepared to bring her country back to the top. In the Universal Beauty book, released that year, she is mentioned as having the best body in the history of the pageant (despite there being no scores). After Miss Universe, Renata became a model for Pantene and Avon. She became a quiet figure to the public, not choosing to go into the TV world but instead going to radio where she has become a popular figure. In 2006, she married Eduardo Guerra Gutiérrez and the couple now has two children together. This year the pageant was able to be pushed earlier, to December 18th, 2005. From the beginning the major front runners were Mia Taveras, an industrial engineering student, from Santiago; Eva Arias, a fashion model and rumored cousin of Renata Sone (haven't actually confirmed it), representing Espaillat; and Dawilda Gonzalez, who was a runner up in 2004, as Miss Distrito Nacional. In the preliminary, Mia Tavares was awared the award for the Best Face and Eva Arias was given the "Miss Fashion Look" award. At the end, Mia Tavares was able to edge out her competitors and be crowned Miss Republica Dominicana 2006 by Natalie Glebova, Miss Universe 2005. With several months to train for Miss Universe, Mia did much of her training with Zuleyka Rivera in Puerto Rico. The two also did a lot of traveling to Miami and New York in order to prepare for Miss Universe. Part of Mia's preparation included a nose job and a balanced diet + gym regimen. At Miss Universe, Mia lacked the oomph that was needed in that year's fierce competition. Many felt that Magali Febles focused too much attention on Zuleyka and little on Mia, specifically when it came to the evening gown portion. This is a comment that will regurgitate in the next following years. Some fans also felt that Eva Arias should have won if Miss Universe was looking for a fierce representative. But at the end of the day Mia redeemed herself after she won both Miss Global City and Miss Continente Americano. In doing so, she became the first winner of both pageants. Since giving over her title, Mia has turned to acting; most notably for starring in the first Dominican novela, Tropico. She continues to model and has done some commercial work. As of recent there are rumors that she is planning on starring in a Dominican film this year as the protagonist. The 2007 competition was a strong year, with a batch of new candidates to the pageant scene. The favorites that year were Ada Aimee De La Cruz (San Cristobal), Iona Giouzeppos (Puerto Plata), Marianne Cruz (Salcedo), Sarah Rivera (Com. EEUU) and Massiel Taveras (Santiago). Massiel garnered alot of attention as her cousin, Mia Taveras, was the reigning queen and her sister, Isaura Taveras, had been 1st runner up in 2004 and was now a tv host. Most people that followed the pageant that year agree that Massiel was the least desired of the group of favorites but her large personality (which is why she won Miss Communication) and enviable figure allowed her to stand out against her inexperienced competition. Yet it was evident that her other competitors were slightly more favored; Miss Salcedo bagged Best Face and Miss San Cristobal bagged Best Smile and Photogenic. After the preliminary a shocker happened when Miss Puerto Plata was forced to withdraw from the competition. Apparently she had tested positive during the drug test. Her disqualification was confusing for people and she later went on TV to discuss it, claiming that the allegations were false. But with the contest a few days away, the drama was quickly forgotten. The finale paid tribute to Dominican culture and showed clips of past beauty queens throughout the decade as a celebration of the 50th anniversary of the competition. When the final 5 was announced, a lot of fans were shocked when only Salcedo and Santiago entered from the favorites. Fortunately the election was just with Salcedo as 1st runner-up and Santiago as the winner. As Miss Republica Dominicana, Massiel went the traditional training, which included a physical regimen and an evaluation by a plastic surgeon. Massiel was criticized for her less then natural looks which included breast implants and a supposed rhinoplasty. At Miss Universe, Massiel presented herself well, always styled well and prepared for every event. She was even favored by some as becoming a semi-finalist, yet unfortunately she remained unplaced at Miss Universe. After Miss Universe, Massiel got the opportunity to compete in Reina Hispanoamericana after the contest decided to open up the competition to women from the Caribbean. At the contest she was an insta-favorite having won both the Best Silhouette and Best Face. She became to win the first Dominican woman to win the contest, while also debuting for the country. The year after she would crown Mexican beauty queen, Laura Zuniga (and we all know how that ended up). Currently she is promoting the creation of a special seal that was developed to distinguish and promote beauty products made in the Dominican Republic. Massiel is a socialite and can constantly be seen attending award shows, both here and in the US. Thank you for reading! Hope you enjoyed the thread. Re: What Happened After Amelia? LARIMAR FIALLO - She had an amazing body, but yeah her nose was distracting! She was heavily bashed back in her year! She posed some threats in Miss Universe though and i'm sure she was fighting for a back to back placement at the very least! It's amazing that her runners up YADIRA and CLAUDIA both placed as 1st runner-up in MI and MW! MIA TAVERAS - Honestly I disliked her ever since she was crowned! Maybe because of the hype I guess, during that period Dominican beauties were feared upon, in my opinion Dominican reps to Miss Universe were stronger than Venezuelans (circa 2004-2006). MASSIEL TAVERAS - I agree with you, she was impressive in Miss Universe 2007. I actually rallied behind her, there were some bashers who hated her, (again maybe because of the strong presence)! I just can't believe that 2 of her runners-up did so well in Miss Universe '08 and '09!! MARIANNE CRUZ GONZALES - Her beauty was polarizing but she has an amazing stage presence! it's hard to ignore her. I appreciated her during the finals in Vietnam! ADA AIMEE DELA CRUZ - she was soooo close to winning as we all know! If Amelia Vega brought forth the Dominican breakthrough in Miss Universe, ADA AIMEE to me was the epitome' of Dominican Pulchritude! Can't wait for your PART 3: and can you please make a collage of all the DOMINICAN Beauties who did well in the Big 5?? I'd love to save it! thanks! And there's a collage somewhere around, made by some forumer. I'll see if I can find it. Great article. More of this please. MISS_TWIX wrote: Enjoyed reading this OMA.. Thank you! Definitely hope to see more of these as well. I always feel so lost when I follow some pageants because I never followed them long enough to know the stories and history. Massiel And Renata are my favorite Dominican in Miss Universe! Loveem! I always like DR girls during the opening because of their accent and how they say their country's name. Rrrrrepublicaaa Dominiicanaa!!! In 2009 when Ada Aimee reached Top 5, I was pretty sure she would win but I felt like thrashing my TV when she was declared 1st RU.. I mean how political a pageant can get.. No offense to Stefania, but it was totally unfair..
Re: Dom Rep: What Happened After Amelia Vega? I THINK AMELIA OPENED DOORS FOR DOMINICAN REPUBLIC ! GIRLS WHO MADE TO THE SEMIS ARE ALWAYS SUPER !! RENATA, MARIANNE, ADA AIMEE, AND YARITSA !! ALL OF THEM ARE STUNNING AND TALL !! MESTIZAS AND MORENAS HAVE EQUAL CHANCE !!! I'M A FAN OF DIVERSE BEAUTY OF DOMINICAN !! tresure wrote: I THINK AMELIA OPENED DOORS FOR DOMINICAN REPUBLIC ! Definitely agree, after she won all pageants in DR witnessed a boom.